American Paper Optics, LLC, the world's leading manufacturer of 3D glasses, rolls out another optical technology -- Wobble Vision. With Wobble Vision your next print, website, direct mail, or on-pack premium can swing, scream, shake, and quake, getting you the results and impact you need. Just think of it as "Promotion in Motion". Using our patented Wobble Wands and our expertly "Wobbled" images, consumers interact with your advertising messages, bringing them to life. 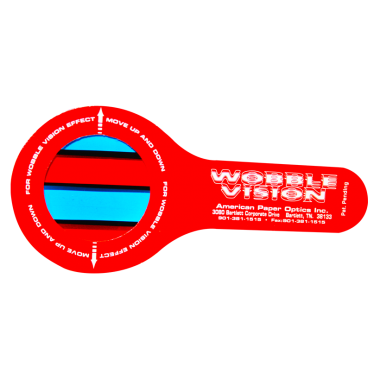 Simply close one eye and slowly move the Wobble Wand up and down to see the magical effects of Wobble Vision. Betcha can't stop! Your print promotion or website will be transformed into an interactive delight for the senses, delivering moving advertising results. Just Wobble! Protected under US Patent 6,807,759.